Issues related to health should find a permanent place in international diplomacy, Union Health Minister Harsh Vardhan said Friday. "Given the scary global disease burden scenario, it is necessary to give health a permanent place in the format of international diplomacy. 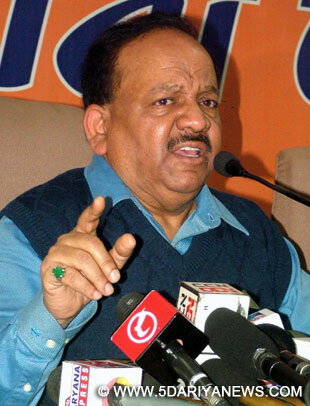 Countries need to both externalize and internalize health paradigms as, in the globalized world, there is no room for complacency," Harsh Vardhan said.He said: "No country, however rich and powerful, has the capability to marshal all the intellectual and physical resources that are necessary to fight the rising burden of communicable as well as non-communicable diseases. "They want to reach out to give as well as receive cooperation. It is time to institutionalize this in the rubric of international diplomacy." "I have informally proposed that a regional meeting of foreign and health ministers under one roof be held as a first step, and WHO agreed in principle to build upon the idea and make it a reality," he said, returning from Dhaka where he attended a multilateral meeting organised by the World Health Organisation (WHO) of 11 health ministers of the south-east Asia region.In Dhaka, the health ministers, who attended the WHO regional committee meeting, adopted resolutions to accelerate health action in key areas.The regional committee endorsed the regional strategy for strengthening the role of the health sector in Civil Registration and Vital Statistics (CRVS).The committee noted that reliable data is essential for effective health planning and management, and that CRVS systems are crucial to obtain continuous, compulsory and cost-effective data on births, deaths and causes of death.